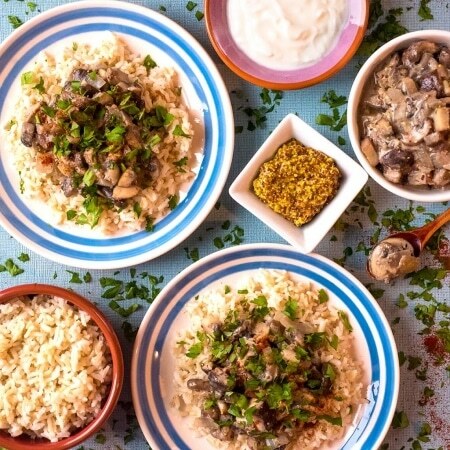 With a selection of different mushrooms, some garlic, shallots and crème fraîche, this Mushroom Stroganoff is a creamy and comforting vegetarian meal that will help you to cut down on meat and you won’t even miss it. Serve it with rice, on a baked potato or add the leftovers to quesadillas. In a bid to eat less meat and to lower our calorie intake a little bit, we have been eating a lot more mushrooms. Not only do they have a really meaty texture, but they are super low in calories and can really bulk out a meal making you feel fuller for less. 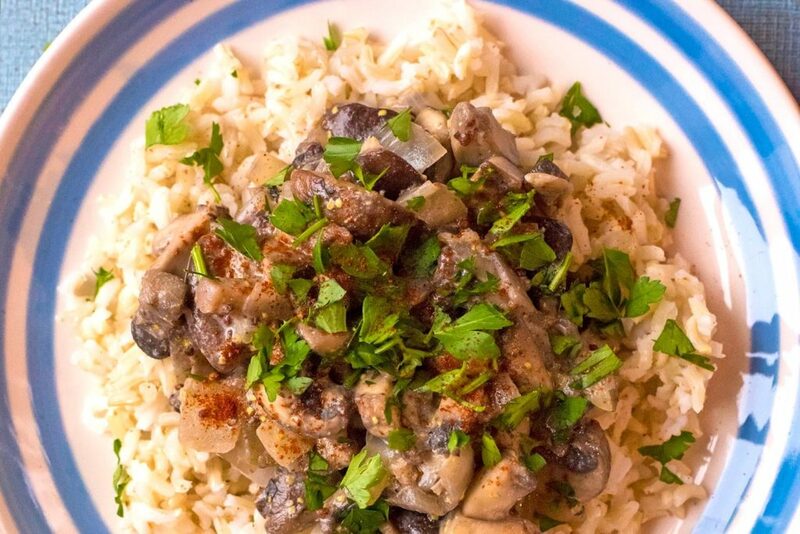 The key to making this Mushroom Stroganoff a weeknight winner is to use as many different kind of mushrooms that you can find. Don’t just stick to plain white mushrooms, as there are so many out there with such different textures and flavours. The creme fraiche makes it super creamy and a spoonful of mustard adds a lot of extra flavour. We are a little bit mushroom obsessed at the moment. You might have noticed that from all the mushroom recipes that have been popping up on the blog recently. 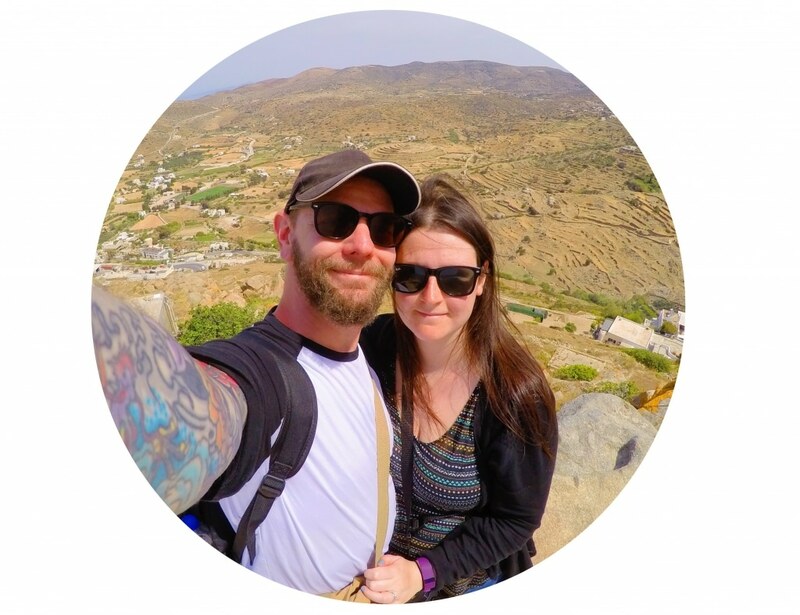 But they are so versatile and we are loving discovering all the different ones out there now that supermarkets are starting to stock more than the basic type. 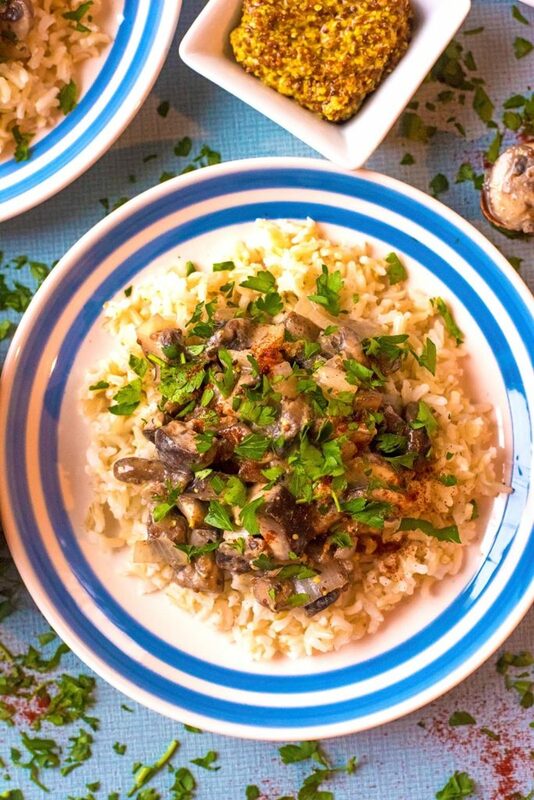 This recipe uses button, chestnut, shittake, oyster, mini portobello and wild mushrooms and that gives this dish so much texture and flavour. 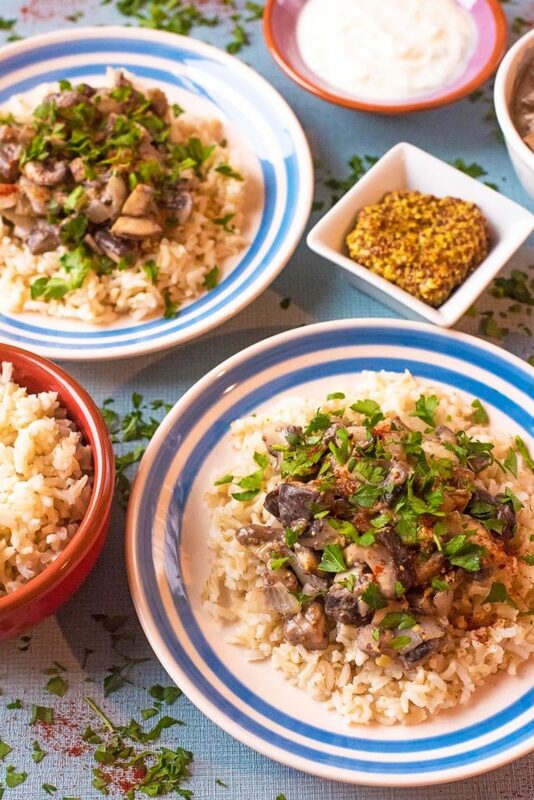 Whilst stroganoff is traditionally made with beef and originates in Russia, we ate some incredible mushroom stroganoff when we visited Poland a couple of years ago and were amazed at just how easy it was to recreate when we got home. 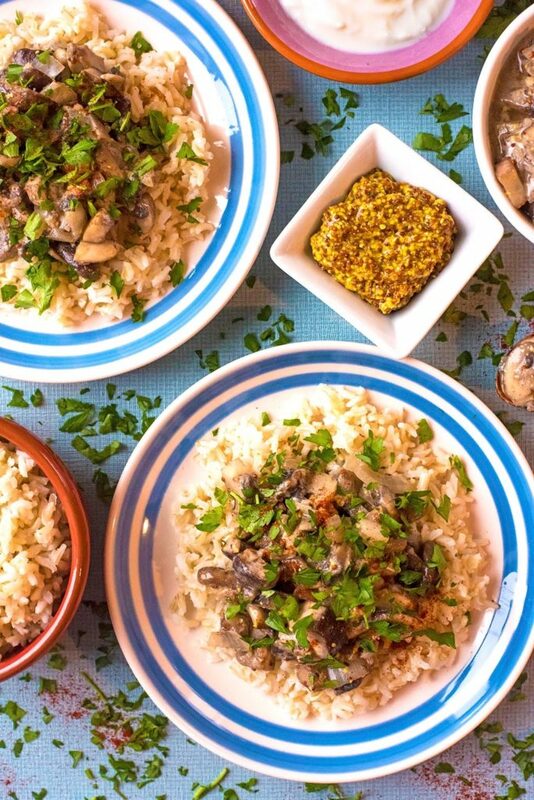 As with lots of Eastern European meals, this is really budget friendly (if you used just the basic type of mushrooms) as a lot of the added flavour comes from things you would have in your cupboard anyway, like mustard and paprika. I know that there are a lot of anti-mushroom people out there, but they probably aren’t reading this recipe. 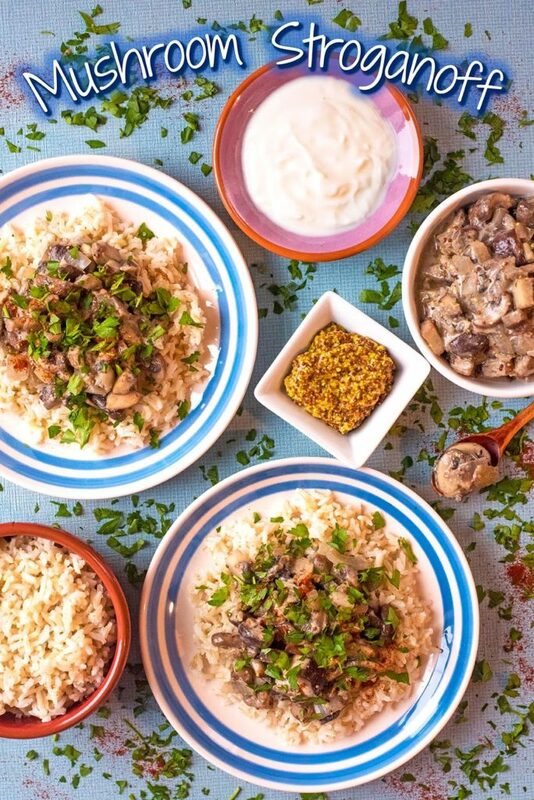 If you live with a mushroom hater, then you could easily have two pans on the go – one with mushrooms and one with chicken/beef and add the same sauce to both for a mushroom stroganoff and a meat based stroganoff. We are big on trying to make dinner time as easy as possible, even when everyone does have different tastes. This recipe is really easy to make vegan, as the majority of ingredients are vegan already. It’s just the creme fraiche that you need to swap for a vegan alternative, and Oatly do a great one. You could even add some fried tofu for some vegan protein. 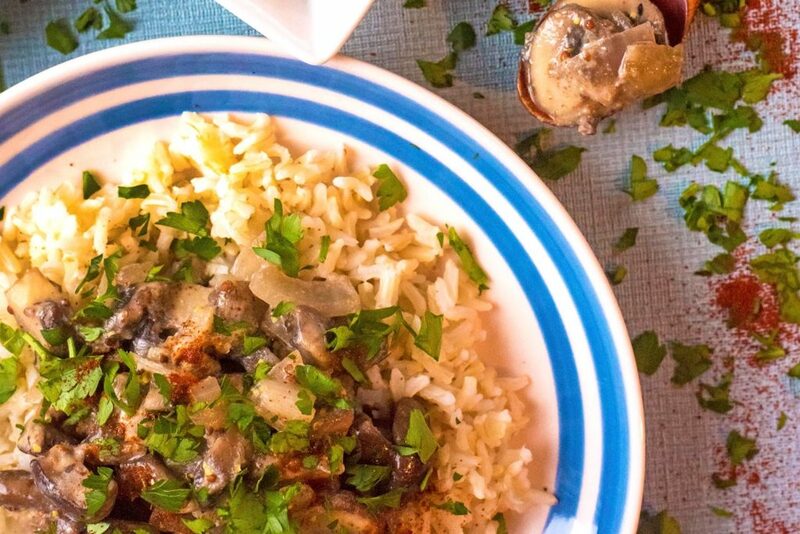 Can You Freeze Mushroom Stroganoff? You can freeze it, but the creme fraiche tends to separate a bit and it changes the texture when reheated. It’s so quick and easy to cook from fresh (it takes less than 10 minutes) that I would recommend just cooking it when you plan to eat it. When it comes to serving the stroganoff, you have lots of options. We served it with rice, as it is cheap and filling, but we have also had it stirred through pasta and on a baked potato for dinner. You know we are big fans of leftovers too, so we usually make a double batch of this and we have made some epic quesadillas with it as well as adding it so a brioche bun with some homemade slaw. That one is messy, but totally worth it! One: Put a little oil to a pan and add the mushrooms, shallots and garlic. Gently cook for 5 minutes, stirring ever minute, until the shallots have softened. Two: Turn the heat off and add the creme fraiche, mustard, paprika and salt and pepper and stir. Three: Serve on rice with parsley. This isn’t the best recipe for freezing, as the creme fraiche can separate when reheated. But, it only takes 10 minutes so it’s best cooked fresh. You can make this vegan by using Oatly creme fraiche instead. The key to this recipe is using a selection of different mushrooms, so try to add a variety. You could add some chopped chicken or steak strips to this, but cooking times would vary. 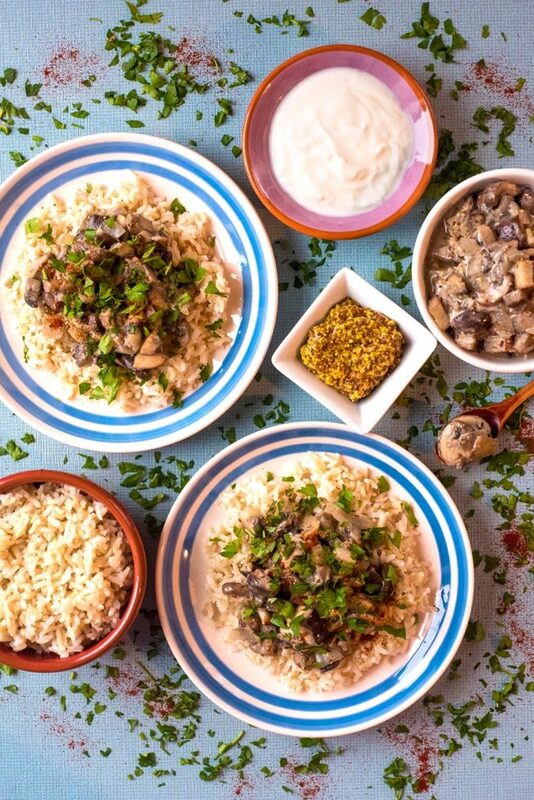 With a selection of different mushrooms, some garlic, shallots and crème fraîche, this Mushroom Stroganoff is a creamy and comforting vegetarian meal that will help you to cut down on meat and you won't even miss it. Add a little oil to a large pan and add the mushrooms, shallots and garlic. Gently cook for 6 minutes, until the shallots have softened. Turn the heat off and stir in the crème fraîche, mustard, paprika, salt and pepper. Serve with rice and sprinkle with parsley. Will do this tonight. Thanks for this recipe. What a delicious and hearty dish! It’ll be perfect for the cold weather in the forecast – thanks for sharing! !